The hamlet Monte Baserria is located in a peaceful environment, ideal for resting, in the heart of the Lea-Artibai region. 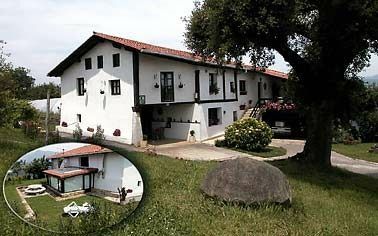 This corner of Bizkaia is quite virgin as far as exploitation is concerned and is the owner of a great scenic beauty with very emblematic sites and that makes possible all kinds of activities. Full accommodation rural house built in the year 1800, rehabilitated in 1984 and opened to the public in 1997. Enjoy our facilities that we put at your disposal to make your stay even more pleasant among us. We have a 30% OFFER for the weekends of the months of JANUARY and FEBRUARY. Check with the owner.